Below is a list of the largest and most famous Diamonds. Sefadu, 620 carats rough / found 1970. Sefadu was found in Sierra Leonne in 1970. It is owned by the American diamond company Lazare Kaplan. The uncut stone weighs 620 carats. This is the largest Diamond in the world known at this time, although if cut, will no doubt be smaller than three or four of the largest cut diamonds below. Golden Jubilee, 755 carats rough / 545 carats cut / found 1985. The Golden Jubilee is currently the largest known cut diamond in the world. The discovery of this large brown diamond in 1985, of 755.5 carats, was at the Premier mine in South Africa, also where the Cullinan diamonds were found in 1905, and others such as the Taylor-Burton in 1966, and the Centenary in 1986. The Golden Jubilee was purchased from De Beers by Henry Ho of Thailand in 1995, it is now held in the Royal Thai Palace as part of the crown jewels. Cullinan I, 3,025 carats rough /530 carats cut / found 1905. The Cullinan diamond was the largest diamond found at the Premier mine in South Africa in 1905, weighing an amazing 3,025.75 carats. The diamond was gifted to Edward VII by the government of the Transvaal as a birthday present. It was cut in Amsterdam into 2 large stones (the Cullinan I and Cullinan II ) and another 7 smaller stones. The Cullinan I, or the First Star of Africa, is set in the British Sovereign's sceptre with cross. This was the largest polished diamond in the world until the discovery of the Golden Jubilee Diamond in 1985 at 545.67 carats. The Sceptre with the Cross, and the other Crown Jewels, are on display at the Jewel House in the Tower of London. Incomparable, 890 carats rough / 407 carats cut / found 1980s. The Incomparable was found in the town of Mbuji Mayi in the Democratic Republic of Congo, in the 1980s, by a young young girl playing in rubble outside her uncle's house. The girls uncle sold it to local African diamond dealers, who in turn sold it to Lebanese buyers, who sold it to De Beers, who sold it to Donald Zale, chairman of the board of the Zale Corporation, a Dallas based jewelry store chain. In November 2002, the Incomparable was listed on the internet auction site Ebay. The seller was expecting to attract bids of over $15 million. The stone was not sold. Cullinan II, 3,025 carats rough /317 carats cut / found 1905. The Cullinan diamond was the largest diamond discovered in the Premier mine in South Africa in 1905, weighing 3,025.75 carats. It was awarded to Edward VII by the government of Transvaal for his birthday present, then taken to Amsterdam to be cut into 2 principal stones (the Cullinan I and Cullinan II ) and 7 other major stones. Cullinan II, 317.4 carats, is set in the lower front of the British Imperial State Crown. The British Imperial State Crown, and the other Crown Jewels, can be seen on display at the Jewel House in the Tower of London. Spirit of de Grisogono, 587 carats rough / 312 carats cut /found ? 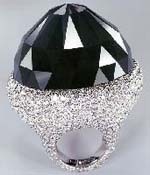 The Spirit of de Grisogono is the world's largest known cut black diamond, 5th largest cut diamond in the world. It is set in a white gold mounting, with 702 small white diamonds totaling 36.69 carats. This diamond was mined several decades back in west Central Africa. It was later taken to Switzerland where it was cut using the Mogul diamond cutting technique. The Spirit of de Grisogono is described as a rare specimen for this type of diamond. The stone is said to have been sold by Fawaz Gruosi to a private client. The Great Mogul, 787carats rough / 279 carats cut / found 1650. The Great Mogul is one of the worlds largest diamonds, named after Shah Jehan, builder of the Taj Mahal. This is the largest diamond ever found in India, in the Golconda mines in 1650, and cut by the Venetian, Hortentio Borgis. The diamond is said to have either been lost, or now known under another name, in the possession of the Shah of Persia, or to be among the jewels of an Indian prince. Centenary Diamond, 599 carats rough / 273 carats cut / found 1988. The De Beers Centenary Diamond, at 273.85 carats, was the third-largest diamond found in the Premier Mine in South Africa. The Centenary Diamond is rated as the highest grade of colorless diamond. It is said to be flawless. The diamond may have been sold in June 2008 to an unknown, young, European entrepreneur, living in the United States. Millennium Star, 777 carats rough / 203 carats cut / found 1990. The Millennium Star is owned by De Beers, the world's second largest known top-color, pear-shaped diamond. The diamond was found in the Mbuji-Mayi district of Zaire (Democratic Republic of the Congo) in 1990. It was bought by De Beers during the country's Civil War in the early to mid-nineties. The diamond was first displayed in October 1999 as the main attraction of the De Beers Millennium diamond collection. The collection includes eleven blue diamonds and The Heart of Eternity. Their display at London’s Millennium Dome in 2000, led to a plot to steal the collection. On the 7th November 2000, police monitoring the gang, arrested all involved after they began easily breaking through the security systems, something the police thought impossible. Orlov, 189 carats cut / found 1700s ? The Orlov is part of a collection in the Kremlin in Moscow. The origin of this diamond can be traced to a Hindu temple from the 1700s in Tamil Nadu, southern India. Count Grigory Grigorievich Orlov, is said to have bought the diamond for 400,000 Dutch florins. He gifted the diamond to Catherine the Great of Russia in an attempt rekindle their romance. His expensive gift failed miserably, as not only did Cathrine marry someone else, she held on to the diamond. Cathrine had her jeweler, C. N. Troitinski, design a sceptre to display the Orlov on, becomming part of the Russian Crown Jewels. Now known as the Imperial Sceptre, it was completed in 1784. Regent Diamond, 410 carat rough / 141 carats cut / found 1698. In 1698, a slave found this diamond in a Golkonda mine in the state of Andhra Pradesh, India. An English sea captain is said to have killed the slave and made off with the diamond, then sold it to an Indian merchant. Thomas Pitt then acquired the diamond from a merchant in Madras in 1701, said to be for £20,400, about £2,964,490 in 2010 with inflation. He had it cut in the design cushion brilliant. The diamond was sold to the French Prince, Philippe II, Duke of Orleans, in 1717 for £135,000. In 1792, during the revolutionary wars in Paris, the diamond was stolen along with other crown jewels. 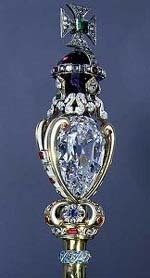 The Regent Diamond was later found and has been on display at the Louvre Museum in Paris since 1887. Premier Rose, 353 carats rough / 137 carats cut / found 1678. The Premier Rose Diamond was found at the Premier Mine, of De Beers in South Africa. The rough diamond was cut to produce two main diamonds of 137 carats (Big Rose) and 31 carats (Little Rose). The Premier Rose collection are claimed to be among the finest polished gems in the world, for symmetry and proportions. The Premier Rose was sold in 1979 to an anonymous buyer for about $10,000,000. Koh-i-noor, 105 carats cut / found 1300s ? The Koh-i -noor, meaning "Mountain of Light" in Persian, was once the largest diamond in the world from the state of Andhra Pradesh in India. It has been owned by Hindu, Mughal, Persian, Afghan, Sikh and British rulers who fought for the diamond over centuries. It was acquired by the British East India Company for the British Crown Jewels when Queen Victoria became Empress of India in 1877. The Koh-i-noor is now mounted on one of the crowns on display at the Tower of London, the crown made for Queen Elizabeth, the Queen Mother. Allnatt Diamond, 101 carats cut / found ? 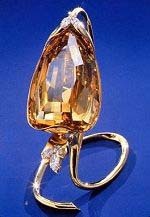 The Allnatt Diamond has a cushion cut and rated in color as Vivid Yellow The diamond is named after one of its holders, Major Alfred Ernest Allnatt, a soldier and sportsman. It is believed the diamond was probably found in what is now the De Beers Premier Diamond Mine in South Africa. The Allnatt was sold at auction in May 1996 by Christie's in Geneva for US$3,043,496. The SIBA Corporation, that bought the stone, had it re-cut to its current weight to improve clarity. The Allnatt was displayed aat the Smithsonian's (The Splendor of Diamonds) exhibit with the Millennium Star and The Heart of Eternity. Star of the East, 94 carats cut / found ? The marrage of Edward B. McLean and his bride Evalyn in 1908 saw them travel to Europe for their honeymoon, each with $100,000 from their fathers as wedding presents. After the couple reached Paris, Pierre Cartier showed the couple the Star of the East, that is said to have belonged to the Sultan Abd al-Hamid. The couple bought the Star of the East for $120,000. After Evalyn's death, Harry Winston bought the diamond in 1951. The Star of the East was last displayed at the Metropolitan Museum of Art, New York, in 1978, at a reception for the 50th anniversary of Harry Winston Inc. The diamond is now at an unknown location. Shah Diamond, 88 carats cut / found 1400s ? The Shah Diamond is yellow diamond that is extremely clear. It was found in Central India, around 1450. The diamond was owned by the Shahs of Iran for many centuries. In 1591, Shah Nizam had carving cut on one of the facets. Also in 1591, ruler of Northern India, the Great Moghul Akbar, invaded Ahmadnagar and made off with the diamond. In 1738, Nadir Shah invaded India, seized the diamond, and returned it to Persia. In 1829, Russian diplomat and writer, Alexandr Griboyedov, was murdered in Tehran. To regain peaceful relations with Russia, the Shah diamond was given to the Russian Tsar as a present. The Shah diamond is now one of Seven Historical Gems on display in the Kremlin. Idol's Eye, 70-carats cut / found ? The Idol's Eye is a diamond with a slight bluish tinge, similar to diamonds from the Golconda Mines in Southern India. The cut of the diamond is between an old-mine cut and a triangular brilliant. The name Idol's Eye may measn it was stolen from the eye of a Hindu idol in a temple in India. Other diamonds believed to have had similar origins, are the Orlov and Hope diamonds. In January 1983, Mr. Laurence Graff bought three large diamonds, the 70 carat Idol's Eye, 41 carat Emperor Maximilian, and 70 carat Sultan Abdul Hamid II, beleived to be for the same client, said to be one of the top diamond deals ever. Taylor-Burton Diamond, 241 carats rough /68 carats cut / 1966. 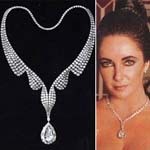 The Taylor-Burton diamond became famous when the actor Richard Burton bought it for his wife Elizabeth Taylor in 1969. The diamond was found in 1966 in the Premier Mine in South Africa. It was cut by Harry Winston to 69.42 carats in the shape of a pear. The diamond was then sold at auction to Robert Kenmore, owner of the luxury brand Cartier, for $1,050,000. After their divorce, Taylor sold the diamond at auction in 1978 for $5,000,000. That money was used to build a hospital in Botswana. The Taylor-Burton Diamond was bought by Henry Lambert, a New York jeweler. The latest owner is Robert Mouawad, who had it cut to 68 carats. Excelsior Diamond, 971 carats rough / 68 carats cut / 1983. The Excelsior Diamond was found on the 30th June 1893 at the Jagersfontein Mine in South Africa, by a worker loading a truck. Until the larger Cullinan diamond was found 1905, the Excelsior was the largest known diamond in the world. It has a blue-white tint. This diamond was cut into ten stones, weighing from 13 to 68 carats. The Excelsior I, was bought by the jeweler Robert Mouawad. SANCY, 55 carats cut / found 1500s ? This pear shaped stone was originaly owned by Charles the Bold, duke of Burgundy, who is said to have lost it in battle in 1477. The stone was named after a later owner, Seigneur de Sancy, a French Ambassador to Turkey in the late 1500s. It is beleived Mr. Sancy acquired the diamond on his travels to the Far East. The Sancy has belonged to a number of famous people such as: King James I of England, Cardinal Jules Mazirin, Prince Nicholas Demidoff in Russia, William Waldorf Astor, and is now displayed in the Louvre Museum in Paris. Hope Diamond, 45 carats cut / found ? The Hope Diamond is a deep blue diamond on display in the Smithsonian Natural History Museum in Washington, D.C. The Hope Diamond is classified as a Type IIb diamond, and said to be cursed. The Hope Diamond is said to have been stolen from an eye of a sculpted Hindu goddess Sita. Tales of the Hope Diamond being cursed began in the 1900s, thought now to have been an attempt to increase its value. Dresden Green, 41 carats cut / found 1700s ? The Dresden Green is a natural green diamond first heard of in 1722 after a London news paper wrote an article about it in its 25th October edition. It is named after Dresden, the city in Germany, where it has been displayed for almost two centuries. In 2000, American jeweler Harry Winston had the Dresden Green displayed in his New York store, then later at the Smithsonian in Washington DC, in the Harry Winston pavilion next to the Hope diamond. The Dresden Green Diamond is a rare Type IIa, said to be internally flawless. It is now displayed in the Staatliche Kunstsammlungen Dresden museum in The New Green Vault.